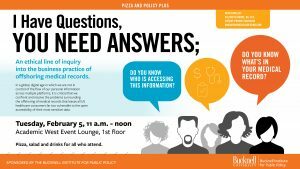 We encourage you to join us on Tuesday, February 5 from 11:00am – 12:00pm in the Academic West Event Lounge on the 1st floor for a Pizza and Policy Plus event on offshoring medical records and patient privacy. Do you know what is in your medical record? Do you know who is accessing this information? In a global, digital age in which we are not in control of the flow of our personal information across multiple platforms, it is critical that we confront and resolve the problems surrounding the offshoring of medical records that leaves all US healthcare consumers far too vulnerable to the open accessibility of their most sensitive data. Elizabeth Burke will remain in the lounge after the event for an additional hour (from 12-1 p.m.) to field extra questions and continue the conversation. Pizza, salad and beverages will be provided for all who attend.